Lazy Budget Chef: The Best Homemade Ranch Salad Dressing Mix Recipe in the World! Do you like homemade buttermilk ranch salad dressing? You can make it with this recipe! Do you like dairy laden ranch salad dressing? You can make it with this recipe! Do you like dairy free vegan ranch salad dressing? You can make it with this recipe! It tastes fabulous! It is less expensive than buying those not big enough packets or bottles of ranch salad dressing mix. I don’t have police the ingredient list because I know exactly what is in it. 1 teaspoon of garlic powder – or more. More garlic = more better in my book! I store my homemade ranch salad dressing mix in an old glass jar in my pantry. Consider this a Choose Your Own Adventure recipe. The salad dressing seasoning mix stays the same. The only difference is you can use your favorite type of milk and mayonnaise ingredients to make Buttermilk, allergy free, and regular ranch salad dressing. 1/4 Cup of buttermilk – if you don’t have buttermilk on hand read my tutorial How to Make Buttermilk from Regular Milk here. It also works on dairy free milk! Chill in the refrigerator after opening but I give you fair warning that it doesn’t last very long the fridge. 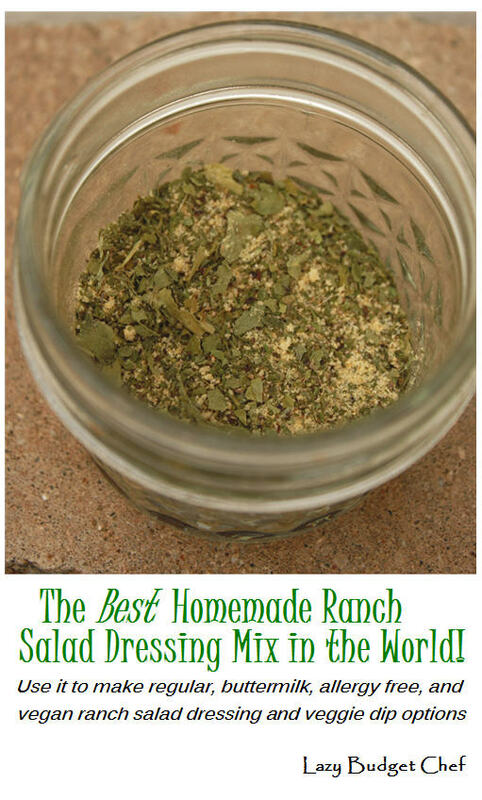 It is the absolute best and tastiest ranch salad dressing mix in the whole, wide world!